If you are looking for one particular song, you are recommended to use the following alphabetical index. Index of my Brassens selection in ALPHABETICAL ORDER. Because of the large number of songs that I have translated, I have had to use three separate blog pages. - As this present page is the homepage of my Brassens translation blog, you can scroll down below to see the titles of the complete list of my Brassens translations, on the three Internet pages explained above. The songs are listed in the order in which I posted them. This means that my latest posting is at the top of the list and my very first is at the bottom. To access the song, click on the song title - which links directly to the song on my blogsite. La traîtresse - Album: " (1960 – Le mécréant,) A complacent lover with an established mistress suffers a shattering disillusionment. La complainte des filles de joie - (album « Les trompettes de la renommée " 1961 - Brassens enjoys the irony that the work of the street girls secretly merges the widely different social classes. Le bistro (Album Le Mécréant 1960) The bistro which he used to frequent in the years when he lived at Jeanne's was a dump says Brassens but the owner, who had been formerly a world class boxer, had a wife who was extremely desirable. Le temps ne fait rien à l'affaire (Les trompettes de la renommée 1961) Brassens humorously rejects the myth that greater human wisdom is an attribute of age. Maman Papa (Not in Album 1954) Brassens' first ever song recorded with the great Patachou, who launched his career. GRAND-PÈRE (Je me suis fait tout petit -1957) - Events after his grandad’s sudden death arouse in him bitter feelings of social injustice. Le Fantôme - (1966 -Supplique pour être enterré à la plage de Sète) -A meeting with a ghost provides him with a hot foretaste of the afterlife. Le mécréant - (Le mécréant 1960) The non-believer, Brassens, tries to follow Blaise Pascal's religious code. Penelope - ( 1960 – Le Mécréant) How lonely, loveless lives can be made less so. Au bois de mon coeur - (1957 - Je me suis fait tout petit) In praise of his loyal circle of close mates - the song he wrote for the film "La porte des lilas." La Femme d'Hector - (1958 - Le Pornographe) Dedicated to one lovely and lovable wife in his group of friends in his early life in Paris. Le mauvais sujet repenti - (1953 - Les amoureux des bancs publics) The pimp whose repentance was not so glorious. Celui qui a mal tourne - (1957- Je me suis fait tout petit) About a man who went wrong. An insight into Brassens' biography? La fessée - (1966 - Supplique pour être enterré à la plage de Sète) Brassens consoles the beautiful widow of an old school friend - inappropriately! La Princesse et le croque-notes (Fernande 1972) Anguish following temptation from a 13 year old. La Rose la Bouteille et la Poignee de main (La religieuse 1969) deplores the loss of the warmth and helpfulness, which people were previously safe to show each other in public. Marquise Les trompettes de la renommee (1961) A love song written by Pierre Corneille - partly! A l'ombre des maris (1972 - Fernande)An entertaining song about the complications of extra-marital love. Don Juan (Album- Don Juan - 1976)The story of a modern Don Juan who has loved many women. Brassens would like us to look at him in a charitable and tolerant spirit. Les Croquants (Chanson pour l'Auvergnat - 1955) Brassens sings of love and marriage believing them to be quite separate. Le testament (1955 - Chanson pour l'Auvergnat). While still a young man, Brassens thinks of the death he is very reluctant to accept. Rien à jeter (1969 - La religieuse) A playful love song extolling the beauty of the woman whom he loved so deeply. Marinette -J'avais l'air d'un c... - Chanson pour l'Auvergnat 1955 .- A light-hearted song about a hopeless lover. Heureux qui comme Ulysse (Not recorded in an album)- The theme song for the last film of the great French comic actor Fernandel. BONHOMME - HER GOOD MAN (1958 - Le pornographe)A poem of great pathos as a peasant woman faces the death of her husband and the memories stirred. Pauvre Martin (1954 - Les amoureux des bancs publics) A sad song about a simple farm labourer, who had asked nothing of life or his neighbours. He earns Brassens' admiration. Le Petit Cheval (1953 La mauvaise réputation) Brassens sings this sad poem by Paul Fort with memorable lines - now a well-known children's song in France. Les châteaux de sable (Brassens) Mistral Gagnant (Renaud)The two songs tell of the transitory joys of childhood. The beautiful Vanessa Paradis sings the 2nd song with Le Forestier. La Première Fille - ( Les amoureux des bancs publics.) 1954 The excitement and enduring memory of a first love. La Marguerite - (Les trompettes de la renommé) 1961 – A simple poem about a parish priest who is suspected by malicious narrow-minded parishoners of a secret love affair. J’ai rendez-vous avec vous - (Les amoureux des bancs publics.) 1954 An early love song of the exhileration of his youthful passion for Joha Heiman. Venus Callipyge (Les copains d'abord) Brassens' song that is pure fun - but not so pure to celebrate anatomy admired all the way back to the days of Ancient Greece. Supplique pour être enterré à la plage de Sète -from the album of the same name. Brassens' thoughts of his final resting place revive nostalgia for the seaside town of his childhood. Putain de Toi - The tramp that you are! (Les Amoureux des bancs publics 1953) A beautiful girl who let him down badly. Trompe la mort - Cheating death (Don Juan 1976) Brassens maintains that his death is not as imminent as the newspapers suggest. A cheerful - if somewhat bawdy- tale of first love. La Cane de Jeanne (Les Amoureux des Bancs Publics) Jeanne's pet duck has died. Brassens writes a solemn dirge - with gentle teasing. Il n'y a pas d'amour heureux (Les amoureux des bancs publics) The melancholic poem by Aragon about the nature of love. Dans l'eau de la claire fontaine (Les trompettes de la renommee) A lyrical song of a chance encounter with a nymph-like girl. L'Orage (Le Mecreant) A tempestuous love affair on the night of a thunder storm. Another poem of love lost. Les copains d'abord (Les copains d'abord) In praise of long-lasting friendships with men who sailed with him on the inland seas near Sete. Link to the full text and translation of Villon's poem. Les amours d’antan (Les trompettes de la renommé) Having sung of the legendary beauties of antiquity in the words of Villon, he now sings of the beautiful girls who taught him love- they are from a very different background. Fernande (Fernande) Carla Bruni's version is included as the second video clip. She tells us that she had been strongly advised not to sing this song, which had been banned for immorality, but she is doing so all the same. Auprès de mon arbre (Chanson pour l’Auvergnat) The nostalgia that Brassens feels for the days when he was young and free - and very poor, unlike today when he is rich,bored and lonely. One of the eccentrics who fascinated Brassens and earned his affection. His first approach to a beautiful, petite young lady who had caught his eye. Brassens sees himself as the total outsider. Je me suis fait tout petit (Je me suis fait tout petit) A somewhat lurid account of the submissive role that he plays in his relationship with his lifelong partner. Il suffit de passer le pont (La mauvaise réputation) The intoxication of the first youthful moment of sexual love, but also the worries involved. Trying to get over the loss of a very beautiful woman. On this blogsite I have posted more than eighty of the famous songs by Georges Brassens, with videos, French lyrics and my translation. My hope is to share my enthusiasm for his songs. In my translation, I seek to make the meaning as clear as possible. Unfortunately a translator cannot convey the poetry, which resides solely in the words written by Georges Brassens. Increasingly I have tried to reflect the rhythm of the songs even though this has moved me away from a precise literal translation. The quality of Brassens verse has been honoured by the most august literary authorities in France. He is a true lyric poet because he expresses thoughts and feelings from the heart. He crafts his words and rhythms with infinite care and skill and he tantalises and entertains with different levels of meaning. And with all this, he does not take himself too seriously and is a great guy! Summary and Historical Background - A vivid picture of life during « The Terror » of the French Revolution. Summary – Biography of Balzac and Complete Student Notes for this Coming of age novel: A young student forces his way into Paris High Society and learns its extravagance, its corruption and its cruelty. Summary – Author’s Biography and Essay Topics – This autobiographical novel shows the crippling effects of an oppressive upbringing in an extremist Catholic family. Summary and Author’s Biography – Essay Topics- This famous novel shows how society treats the individual who is not able to conform to conventional values. In this enigmatic novel, Camus is once again exploring the situation of a social dropout. Summary - Biography of Georges Duhamel - Essay Topics for students- A dramatic and very human autobiographical story of the wild hopes of an impecunious middle class family, living in Paris at the end of the 19th Century. Summary and Full Essay Topics. This classic historical novel tells of life in France of the 16th Century, but reflects the life of Mme de Lafayette’s own time – the court life under Louis XIV a century later. Marcel Pagnol's Biography. - Summary of the novel - Background to the story, which tells of Pagnol’s idyllic family holidays at their remote cottage in Provence during the decade before the First World War. However, drama also intervenes and this is a very moving story. I sang Brassens' songs for twelve years in a tiny French restaurant in Santa Cruz called L'Oustalou, in Santa Cruz, California. He remains my all-time favorite poet, and my mentor (though I never met him) in French (I learned it with his Setois accent); in songwriting, in classic French poetry, and in humanity and integrity. Nark Twain (whose work Brassens knew in translation) would have loved his songs. Bravo! Beautiful work full of love for Georges Brassens, who deserves it. I just want to sugnal a tiny little thing: in "la mauvaise réputation", the translation of "cul-terreux" is not "cultural chap" but "hick". Thank you very much. This is an excellent find in my search for anything Brassens-related. Cheers! I would also recommend the excellent translations done by Pierre de Gaillande from the group "Bad Reputation"! Great blog!! thanks and congrats! Thank you for this fantastic work! give me a fuller context. I first encountered Brassens when I was staying with a French penfriend in Paris in the 1950s.Her father, who was a fighter pilot in WW1, was a huge fan and played his songs. It is wonderful to have full translations and helpful notes. Thank you so much! Having worked through the correct chords for La Maîtresse D'école. (In the round they are Em/Em6/Bm : G/Em/Am/D9/G/Em/F sharp aug/Em/Em/D9/G), I tried to set about understanding/ translating the words - not an easy task of course. I'm sure the rewarding kiss to a schoolboy of the right age will do wonders for his ardour as well as his attainment, but I am struggling from the the merchants, dunces caps, truants, cats and kracks [cracs]. Any help with the translation would be much appreciated! there are many ios development company but only few are good and this blog need to be on application. Many thanks for your efforts. really appreciated. 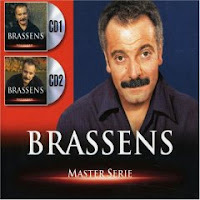 I love Brassens'' songs and occasionally get to sing a few. I have some French but I understand he uses many idioms and it is helpful to get the gist of what is singing about.